American Artist, Michele Devereaux Hardy attended school in the Orient and Europe … All the while absorbing the views of the marine world; ranging from the China Sea to the Mediterranean and the Caribbean. 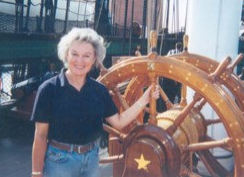 As a student of both American and English history, Ms. Hardy has focused on early American michele_wheelmarine scenes … an era when this nation’s indomitable spirit was reflected in our ‘Clippers’ and ‘Men of War’. Early in her career she lived in Bermuda, where she was an exhibiting member of the Bermuda Art Society. She has also had exhibits in Birmingham, Alabama, Houston, Texas and Indianapolis Indiana where she worked with the Indianapolis Museum of Art. With numerous exhibitions held in leading cities, Ms. Hardy’s works are in private collections throughout the nation. Her works are available for sale as exhibited or on a commission basis. A unique and bright talent, Ms. Hardy adds an additional dimension to southern artists; for in an age of computers and space shuttles, modern art and architecture, she affords us the opportunity to view and ponder a bygone era.